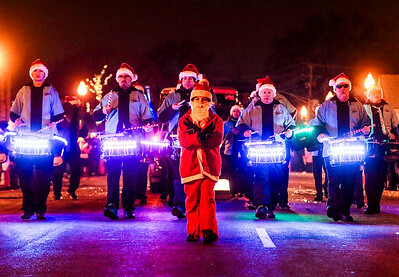 Kyle Grillot - kgrillot@shawmedia.com Santa leads the Crystal Lake Strikers Drumline during the Festival of Lights Parade Friday in Crystal Lake. 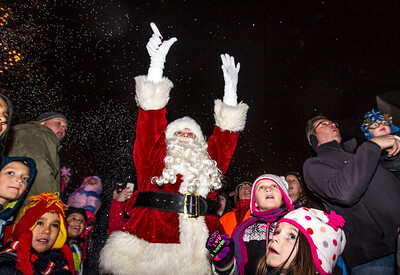 The annual parade of lights, marking the arrival of Santa to downtown Crystal Lake happens every year on the day after Thanksgiving, and is the city's only nighttime parade. 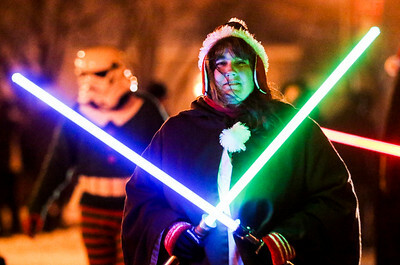 Kyle Grillot - kgrillot@shawmedia.com Cheryl Whitaker of Lake in the Hills walks with a group from the Midwest Garrison 501st Legion during the Festival of Lights Parade Friday in Crystal Lake. 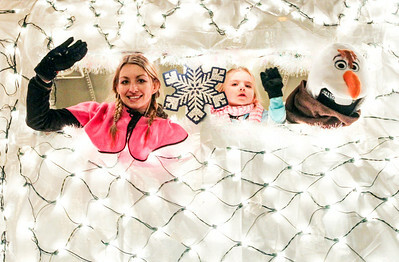 The annual parade of lights, marking the arrival of Santa to downtown Crystal Lake happens every year on the day after Thanksgiving, and is the city's only nighttime parade. 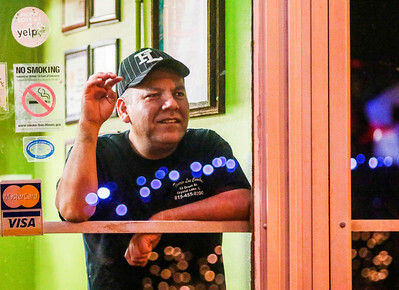 Kyle Grillot - kgrillot@shawmedia.com Guadalupa Juarez of Crystal Lake watches from inside Taqueria Las Cumbres as floats advance on Grant Street during the Festival of Lights Parade Friday in Crystal Lake. The annual parade of lights, marking the arrival of Santa to downtown Crystal Lake happens every year on the day after Thanksgiving, and is the city's only nighttime parade. 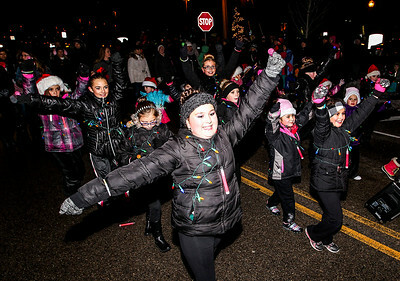 Kyle Grillot - kgrillot@shawmedia.com Members of the All That Dance group advance on Grant Street during the Festival of Lights Parade Friday in Crystal Lake. 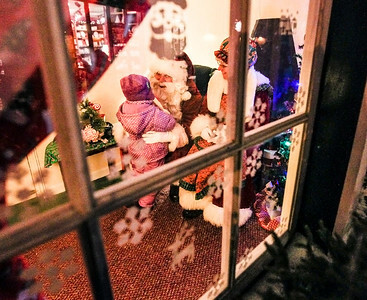 The annual parade of lights, marking the arrival of Santa to downtown Crystal Lake happens every year on the day after Thanksgiving, and is the city's only nighttime parade. 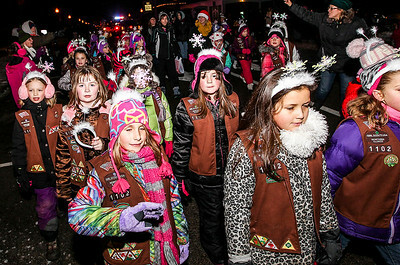 Kyle Grillot - kgrillot@shawmedia.com Members of the Girls Scout Troop 1102 advance on Grant Street during the Festival of Lights Parade Friday in Crystal Lake. The annual parade of lights, marking the arrival of Santa to downtown Crystal Lake happens every year on the day after Thanksgiving, and is the city's only nighttime parade. Kyle Grillot - kgrillot@shawmedia.com Members of the Pizzaz dance Company advance on Railroad Street during the Festival of Lights Parade Friday in Crystal Lake. The annual parade of lights, marking the arrival of Santa to downtown Crystal Lake happens every year on the day after Thanksgiving, and is the city's only nighttime parade. Kyle Grillot - kgrillot@shawmedia.com District 47 School bus drivers and attendants float riders wave from inside a highly decorated school bus during the Festival of Lights Parade Friday in Crystal Lake. The annual parade of lights, marking the arrival of Santa to downtown Crystal Lake happens every year on the day after Thanksgiving, and is the city's only nighttime parade. 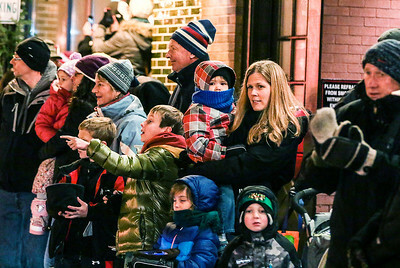 Kyle Grillot - kgrillot@shawmedia.com Spectators watch as a man dressed as Santa Claus throws powder into the air to signal the tree to light after the Festival of Lights Parade Friday in Crystal Lake. The annual parade of lights, marking the arrival of Santa to downtown Crystal Lake happens every year on the day after Thanksgiving, and is the city's only nighttime parade. Kyle Grillot - kgrillot@shawmedia.com Mr. and Mrs. Santa Claus greet a small girl after the Festival of Lights Parade Friday in Crystal Lake. The annual parade of lights, marking the arrival of Santa to downtown Crystal Lake happens every year on the day after Thanksgiving, and is the city's only nighttime parade. 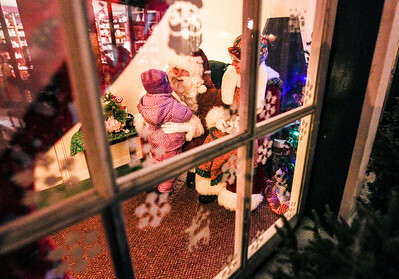 Kyle Grillot - kgrillot@shawmedia.com A man and woman dressed as Mr. and Mrs. Santa Claus greet a small girl after the Festival of Lights Parade Friday in Crystal Lake. The annual parade of lights, marking the arrival of Santa to downtown Crystal Lake happens every year on the day after Thanksgiving, and is the city's only nighttime parade. 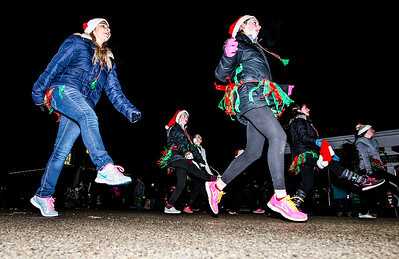 Members of the Pizzaz dance Company advance on Railroad Street during the Festival of Lights Parade Friday in Crystal Lake. The annual parade of lights, marking the arrival of Santa to downtown Crystal Lake happens every year on the day after Thanksgiving, and is the city's only nighttime parade.